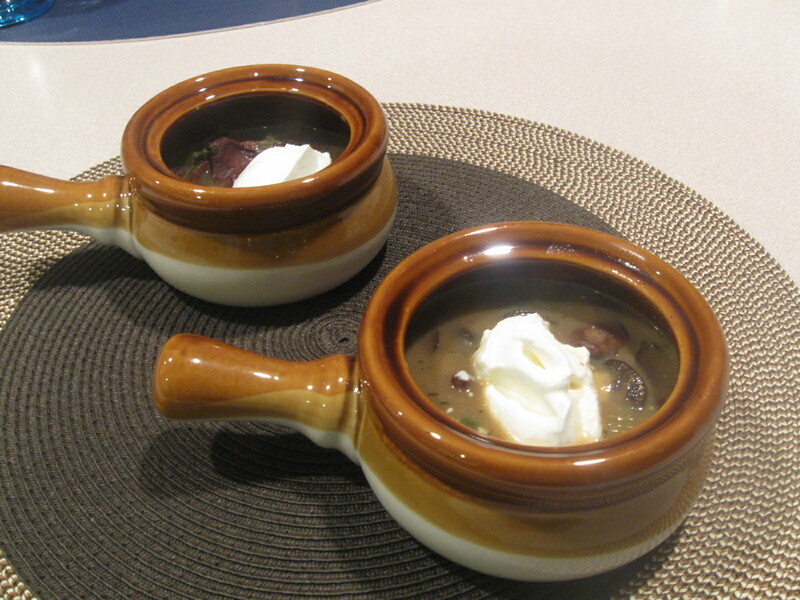 Yesterday I tried a new mushroom soup posted by Magda at mylittleexpatkitchen. I was intrigued by the rustic quality of this version and wanted to give it a shot. It came out very nice. Try it yourself. Despite its rustic look, there’s sophistication in the taste. It will certainly find its place as a first course in menus I put together for guests. Here’s how I made it. How to make: Clean the cremini mushrooms either by brushing them or quickly rinsing them under running water and patting them dry. Slice them. Use your hands to break the chanterelle mushrooms in smaller pieces. Saute the mushrooms in a buttered and well heated pan or pot. Do not crowd the mushrooms so they don’t cook in their water. If they don’t fit comfortably, saute in two bunches, about 5 minutes each. Keep them in a plate. Now, cut lengthwise and then slice the leek. Wash very well and drain. Coat the pan or pot with butter again and saute the leeks, about five minutes. If you’ve been using a pot all along, add the mushrooms. Add the flour and give them a stir. Add the wine, thyme, salt & pepper and cook at low-medium heat for about 20 minutes. Serve with a tablespoon of sour cream. Notes and tips: I didn’t find fresh chanterelle mushrooms so I had to used dry ones. Magda from mylittleexpat kitchen gives great instructions on how to ‘reconstitute‘ them before cooking them. Please, do that. I didn’t take the time to soften them and they came out too hard. Or, if you don’t have the time, get another fresh variety. Also, the recipe called for medium dry sherry but I didn’t have any so I used red wine instead. Yes, they are. Isn’t it funny? I got them originally for French onion soup (which I’m making today) but you inspired me to use them for the mushroom soup.